Can I Sell My House If I Owe Money on It? Years ago you took out a mortgage to buy a home, and today you realize you want to get rid of the home. If the loan is paid off, then you can sell your home for pure profit, with money in your pocket, and move on to the next home. But if you still owe money on that mortgage, you may be wondering if you can sell the house and move elsewhere. You can relax, because there are several ways you can accomplish this even if you owe significant amounts of money on the home. You can sell your home even if you still owe for it. In an ideal situation, you bought your home at a good price. Perhaps you shopped around or haggled, and eventually got a bargain. In the years since you made the purchase, it's possible the homes in your neighborhood have increased significantly in value. You still owe money on the property, but you can price the home for more than you paid for it. Assume you paid $200,000 for your home five years ago, and you still owe $150,000 on the mortgage. You set the price at $250,000, and you get an offer for the full price. You make the deal and take $150,000 of the sale price and pay off the mortgage you owe and walk away with the leftovers -- you now have $100,000 in cash to help you on your way. Even though the previous example is a real possibility for some people, let's return to reality for a moment and discuss what happens when you owe money on a house that is suddenly not worth what you paid for it. Assume that same house you still owe $150,000 on can only attract offers of around $125,000. You are wondering if you can sell it, and the answer is "maybe." 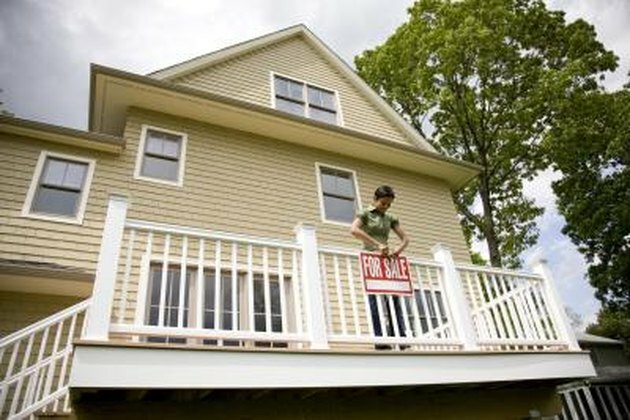 Sometimes, especially in a down market or to avoid a foreclosure, the mortgage lender will agree to allow a short sale. A short sale is when the seller sells the property for a price lower than the money owed and the lender agrees to call it even. The homeowner doesn't make any profit, but he avoids a foreclosure or is able to move on to something he can better afford. In the same situation, when a home is valued less than the amount owed, the lender may agree to allow the sale if the seller will agree to sign a promissory note. If the home sold for $125,000 and the mortgage amount was $150,000, the lender would want the seller to sign the papers and essentially promise to pay back the additional $25,000 in monthly installments over a few years. This isn't an attractive option for many who realize they are paying for something they no longer have. But for some, it may be an option worth considering, and it could save your credit. If you own a home you can't get rid of because there are no offers high enough to meet the payoff amount, and the lenders are not willing to work with you, then you have to make a big decision. You can come up with a way to afford the payments each month or you can face foreclosure. If a home is foreclosed upon, it is no longer in the possession of the mortgage holder as the loan has gone into default. If the mortgage holder just walks away and doesn't meet the obligations of the mortgage, the lender may auction the home to the highest bidder and then sue the mortgage holder for the difference if they choose. Filing bankruptcy can help protect those who are in this situation, although it does catastrophic damage to their credit rating. What Is Considered a Short Term Rental?